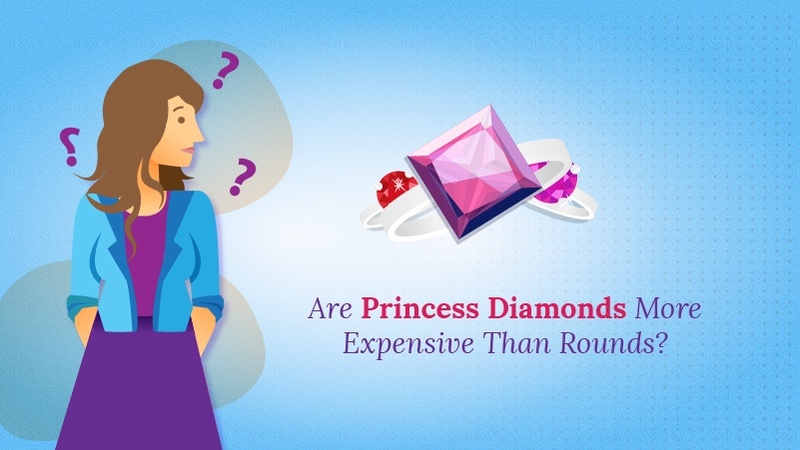 Are Princess Diamonds More Expensive Than Rounds? 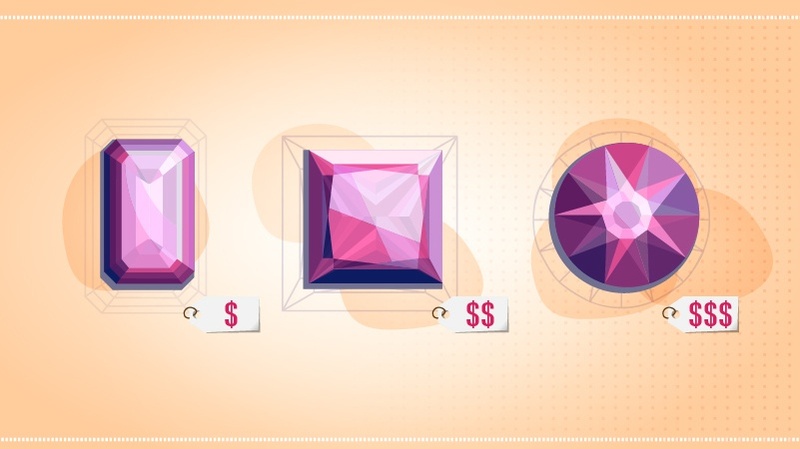 Shopping for the perfect diamond but trying not to break the bank? A Princess Diamond might be the ideal choice. Consistently one of the most popular diamond shapes, next to the round cut, the princess cut is the only diamond shape that can come close to matching the round cut in sparkle and brilliance. Even though round diamonds are the most popular shape and the other shapes are known as “fancy shapes,” round diamonds are more expensive than any other shape on a carat-to-carat comparison, so the princess cut is a beautiful alternative for those on a budget. The princess cut will allow you to attain a wonderful level of brilliance and beauty without sacrificing quality. Though a round cut diamond is best for capturing light leading to greater sparkle, the princess cut also features a brilliant-cut facet style that allows almost the same brilliance. In the end, it may come down to whether you prefer a round shape or the more contemporary look of the princess’s square shape. But if they are comparable in beauty and brilliance, what makes the princess cut consistently cheaper? It all comes down to the cutting process and its efficiency. Many rough diamonds start from a vaguely square, crystalline structure, making the four sided pyramid shape of the princess cut diamond similar to half of the rough stone from which it is cut. This means two equally sized princess cut diamonds can be cut from the same stone with much less waste than what results from a round cut. 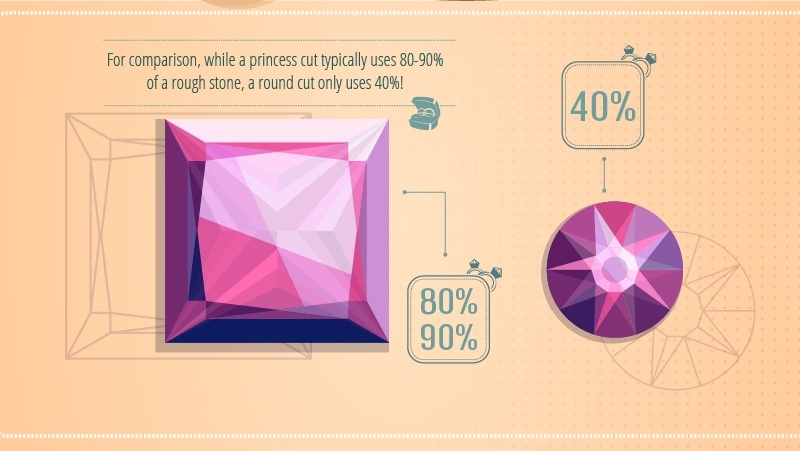 For comparison, while a princess cut typically uses 80-90% of a rough stone, a round cut only uses 40%! The greater yield translates to a lower price for consumers because they are less wasteful in the cutting process. Price is also reduced because the crown surface area of a princess cut stone is about 10% less than a round stone of the same weight. Don’t let this alarm you though! In stones that match carat-for-carat, princess cut diamonds give the illusion of being larger than rounds because the corner to corner measure of a princess cut is typically 15% greater than the diameter of a round diamond. Prices have a wide range on a princess cut as well. Aside from color and clarity differences, this comes down to the degree to which the stone has the representative square shape, or a 1-to-1 ratio of length to width. Though the princess cut is traditionally a square shape, many of them are cut to be slightly rectangular. However, this is often hard to detect by the naked eye, especially once the stone is in its setting. The more rectangular a princess cut diamond, the lower the price. Many buyers actually prefer a slightly rectangular princess cut. Really, it comes down to what you like and what you think looks best. While princess cut stones are consistently less expensive than rounds, it should be noted that the cut is in the middle of the pricing road. 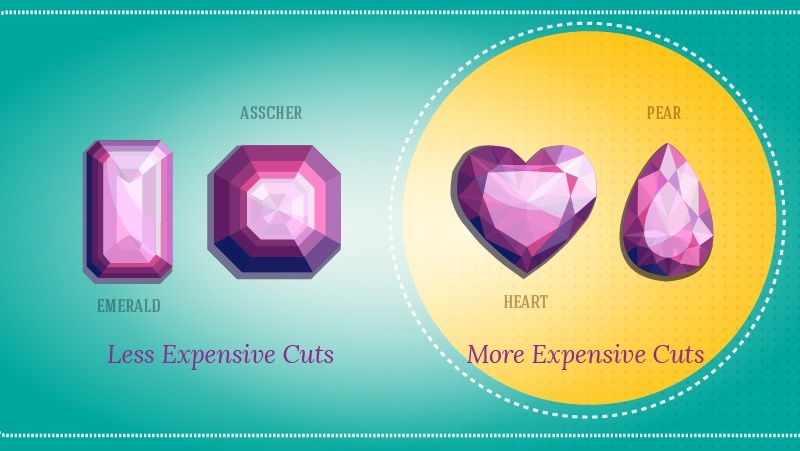 Asscher and emerald cuts are usually cheaper, whereas pear and heart shapes tend to be more expensive. 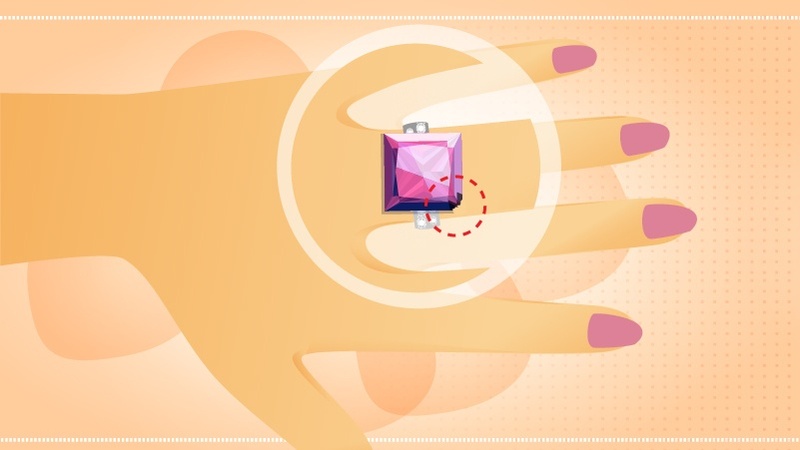 Though shape definitely has an impact on the cost of a stone, there are many other factors to consider when purchasing jewelry. This includes the type of metal you are setting the stone in, as well as the color, clarity, and cut quality of the stone. Round cut stones offer a superior light return, so they naturally obscure the true color of your diamond. Princess cuts offer a similar property, but not to the same degree, so you should be careful to select a higher color rating if purchasing a princess stone. Clarity is, perhaps, the greatest factor to consider because princess cut stones have a slight durability issue. While both princess and round stones are excellent at hiding imperfections, princess cut stones are more prone to chipping over time. 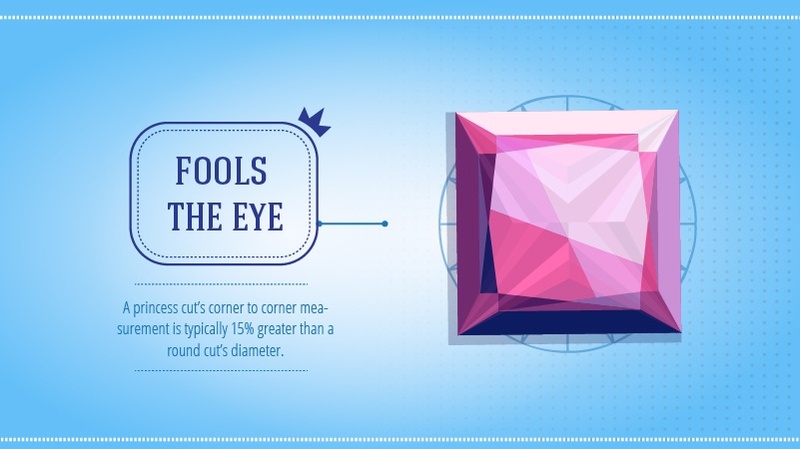 The four sharp corners on princess cut stones are more likely to chip than the rounded edges of a round cut. Though this can be prevented by a strong setting that features V-tip prongs, you want to avoid a princess diamond that has clarity characteristics in the corners so that you minimize the probability of chipping. The princess cut has a lot to offer those after a beautiful stone with a high amount of sparkle and fire. What’s more — it can do so at a lower price than a round cut stone. Be sure to consider factors like color, clarity, and cut quality — but that’s an important consideration no matter what shape you choose. Armed with this information, you can be prepared to purchase a stone that is both stunning and affordable.